(JTA) — In Jerusalem and New York, Jewish activists for an independent Kurdistan hosted events promoting the cause with the participation of Israeli, French and British officials. On Tuesday, the New York event was a first-of-its-kind screening before 700 people of a documentary by the French-Jewish philosopher Bernard-Henri Levy on the Peshmerga, Kurdish fighters combating the Islamic State terrorists in Iraq and Syria. The British and French missions to the United Nations organized the event at U.N. headquarters. Delattre also noted the “unequaled” fight, as he called it, by the Peshmerga – also the title of Levy’s film – against the Islamic State. While a majority of voters in Kurdistan, a semi-autonomous region of Iraq, supported independence in a referendum held in September, the Iraqi government said it does not recognize those results and imposed sanctions, including a ban on outgoing and incoming flights from the Kurdish autonomy. Amid pressure from Baghdad, Kurdish militia soldiers last month ceded dozens of forward positions to Iraqi army troops. The United States, France, Britain and many other countries have opposed Kurdish independence, declaring their support for an undivided Iraq. Levy, one of France’s best-known authors and political commentators, condemned this policy in a speech prior to the screening. “The strongmen of the region, those who believe that man was born to obey, peoples to submit and borders to be carved into the living flesh of humankind — they, alas, had the last word” in Kurdistan, he said. The Knesset event, organized by Zionist Union lawmaker Ksenia Svetlova, was the first time that Israeli officials hosted an event favoring Kurdish independence. Israel was among the first countries to support the establishment of a Kurdish state following a statement on the issue by Prime Minister Benjamin Netanyahu. 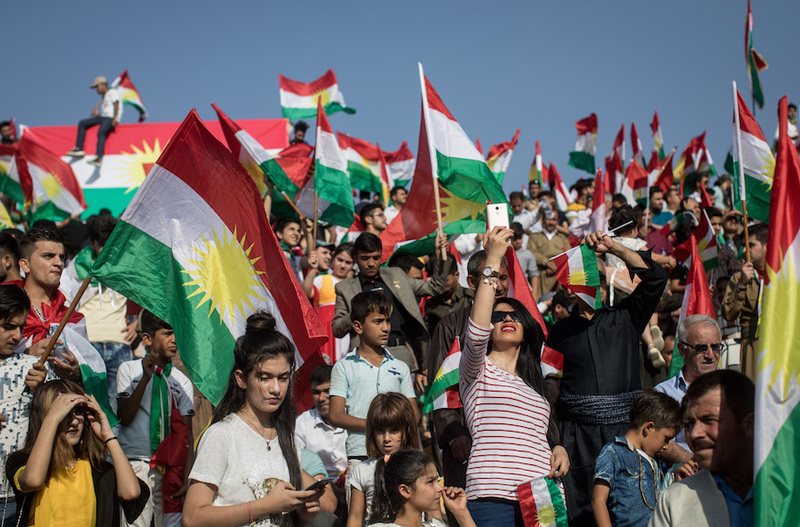 Israel in the past had remained silent on Kurdish national ambitions, which Turkey, a major trade partner of Israel and once also a key ally, has long opposed. Among the non-Israeli Jewish participants at the Knesset event, which was held on the 70th anniversary of the adoption by the United Nations of the Partition Plan for Palestine, was Joel Rubinfeld, a former leader of Jews in Belgium and a campaigner against anti-Semitism there. Earlier this month, Rubinfeld launched the Jewish Coalition for Kurdistan – a group that cites Kurdish-Jewish affinities and whose honorary board includes Harvard Law professor Alan Dershowitz; Irwin Cotler, a former justice minister of Canada; Rabbi Abraham Cooper, the Simon Wiesenthal Center’s associate dean; and Serge and Beate Klarsfeld, two well-known Nazi hunters from France.